Is there a better alternative to Absolute Farkle? Is Absolute Farkle really the best app in Card and Board category? Will Absolute Farkle work good on macOS 10.13.4? 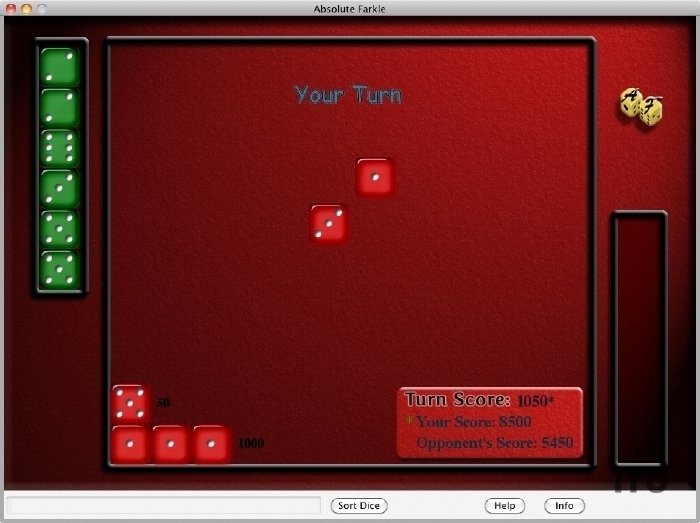 Absolute Farkle is a very addictive dice game that can be played with the whole family. In this version you play against a computer opponent just waiting to give you a run for your money. Or you can play with someone else on the same computer. You can play games using just your voice! After you learn how to play, you can teach the whole family. All you need is a set of 6 dice. Works with Mac OS X 10.6 Snow Leopard without Rosetta. Added ability to use a picture as the backdrop. It will be loaded/used the next time you start up the game. To use a picture, start the game program then drag and drop it over the game. JPG, JPEG, and PNG extension can be used. Absolute Farkle needs a rating. Be the first to rate this app and get the discussion started! The password scheme was changed. If you already have a registered version, this one will require a new password. Do not replace your previous version until you are sure you want to upgrade. If you purchased in the last 2 years I will give a new activation code for free.